There's No Place Like Home: Thank You! First of all I want to thank each and every one of you that left a sweet comment! And I want to thank all of you that have been praying for my family. We can really feel the prayers uplifting us. And I want to say I am so sorry for all of you that have been through this same thing. It almost seems like the majority of you have! I hate that! I did really well most of the week, but today has been a little bit hard. Mainly because today I feel the worst physically. Only 2 days left of that! My surgery is at 3:45 on Tuesday. I can't eat all day! Talk about pouring salt in the wound. How am I supposed to ease my fears and anxieties if I can't partake in some chocolate? Speaking of chocolate...Look what I got! The art teacher at my mom's school, Erin, gave me the cutest bucket filled with goodies! I LOVE this bucket. I think it is the cutest thing in the world! I have already been burning the candle and it smells heavenly. And that cheesecake...it's gone! I did share with Marcus's family today, but I will admit that I ate 2 pieces! Don't judge! That Katie is a smart girl! Thank you Erin! That was so thoughtful of you and it made my whole weekend! Friday night my family came over since Marcus was at work. I think they like each other! And my sister took 1 million pictures of Katie in the bath tub! I guess she's hard to resist! The busyness continued on Saturday, we had a sidewalk sale at Golightly's. I was able to sell lots of stuff, so now I'm rich! 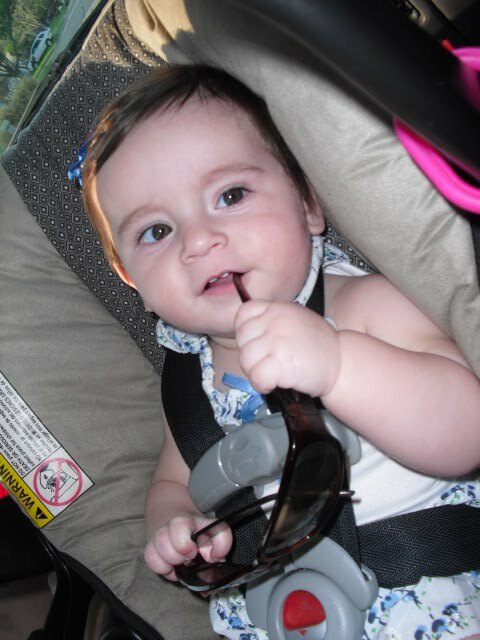 And this little thing kept me busy too. She really is the best medicine for a broken heart. OK the best news of the weekend is that we discovered our favorite snow cone stand is open for the season! 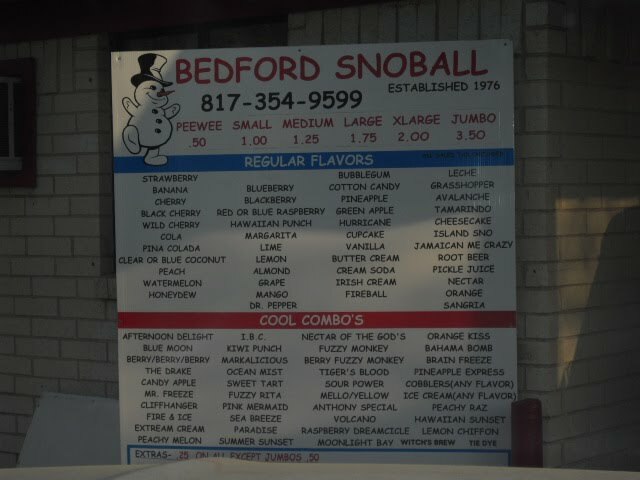 We go to Bedford Snoball and it is THE BEST EVER! They have a drive thru and this is us waiting. I wanted to get a picture of the sign, because they have some crazy flavors. They do have a Tiger's Blood snow cone that Charlie Sheen might be interested in! 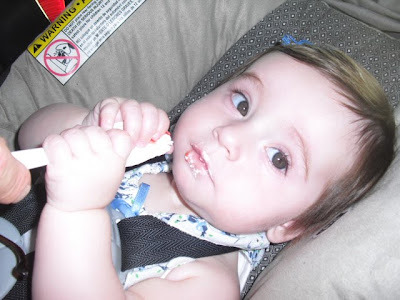 Marcus got strawberry shortcake as usual. I taste tested it for him. YUM! And I got peachy melon, with gummie bears on top! Double YUM! Katie got a little taste, but was more interested in chewing on the spoon. I am not going to waste any more snow cone on her until she can fully appreciate the goodness! All in all it was a good weekend! I am ready for Wednesday to be here. I will be laying in bed and watching movies all day. 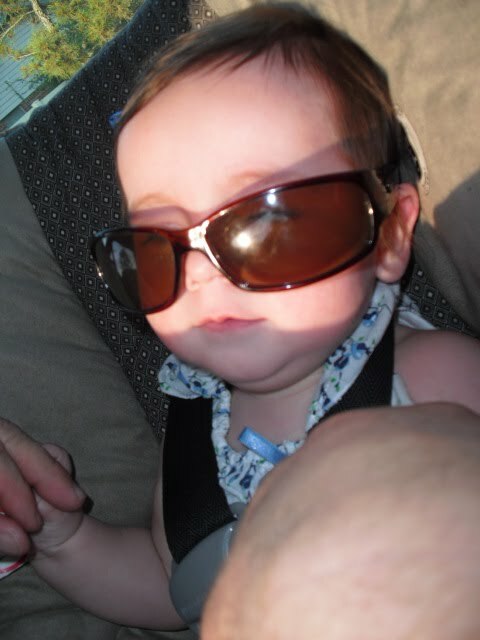 You dont know me but I visit your blog...your daughter is a cutie patooty!! I am also so sorry for your loss and I know that God is watching out for you in the days to come!! Dina- I have been waaay behind on blogs, and have just been catching up on yours. And I am very sorry, but am so proud of you for wanting God's will-even when it is soo hard. I will say this, make sure you ask your Dr to check again for the heartbeat before doing the DNC. I only say this because I have had a few friends that were scheduled after having the same experienice, but big surprise-still a heartbeat, and they have very healthy children now. (Not to get your hopes up ofcourse, but just thought I would pass that along). Oh, and as for movies The Proposal always makes me laugh hysterically!!! So glad you liked the basket of comfort stuff. I read your blog that morning before school and the pics of your mom so happy broke my heart seeing how sad she's been the past couple of days. So I thought about it all morning long and decided you and Donna (who by the way is the greatest person ever) needed some chocolate and things that might bring you a little comfort or joy at such a tough time. I'll be thinking about you and sending you prayers for Tuesday! Hey Dina! I too have experienced what you're going through. Praying for you! As for the movie suggestion... This weekend I watched You Again. It was a funny, silly chick flick:) AND Tangled comes out on DVD Tuesday= too cute! Have you ever seen Must Love Dogs? I watched it for the first time this weekend. It was good. Of course, I love anything with Diane Lane. Here's to a peaceful recovery. I've been in your shoes and it is for sure NO fun. You will never forget but it will get better. At least you have that sweet, precious little girl to love on! Keeping you in our prayers! Katie is such a doll! Sorry, I don't watch movies that often... just little girl ones that my girls watch... I hear the new Barbie one is good! = ) Good luck this week. My hubby loves him some snowcones and we can't wait until the one near us is open! 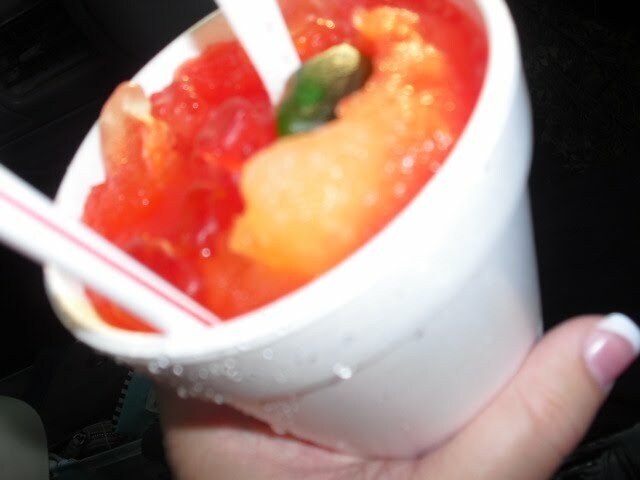 They don't have gummy bears though, so I'm a little jealous of your snowcone. Just saw "The next 3 days" and it was really good! I love to read your blog, our daughters are the same age. Just wanted to say I have been where you are. Giving you a high five. It'll get better. I'll be thinking of you tomorrow and lifting you up in prayer! my heart is with you. This has happened to me more times than I want to count before and after the birth of my son. I will be thinking of you for your surgery and pray for your healing (both physical and emotional). Time does soften these wounds and pain, and of course your beautiful girl is medicine that cannot be rivaled. I am finally 26 weeks pregnant with our #2 after almost six years of trying for her. There was a lot of darkness between back then and now, but thankfully God has been faithful, even when I wasn't so sure.. I always told my son that he was my best medicine. Hold your girl lots; I know you will. I stopped at the Sonic for a Route44 Vanilla Diet Coke and my thoughts went straight to you...Said another prayer right then and there... I know God already is doing His amazing work in your life. It is such a testament to read your positive, uplifting posts when you are suffering, yet faithfully trusting. I wish I could think of some great movies for you but I can never remember movie names....An oldie that always makes me laugh...Addicted to Love. Ok I am very jealous of your snowcone stand and Marcus's Strawberry shortcake one look amazing. 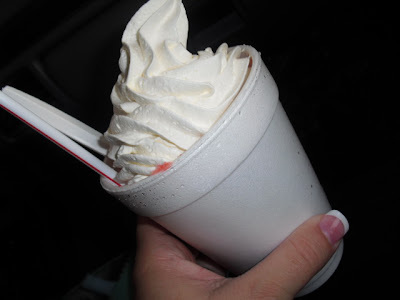 I have got to find a good snowcone stand here in New Braunfels! Hope you are doing ok today and take it easy this evening. I am sure Marcus and Katie will pamper you. How did you know cause well Reese Witherspoon is adorable. Dina...it is exactly 3:42 and I just said a prayer over you and hubby and the doctors! I hope you have peace and heal super quick. Enjoy some yummy chocolate as soon as you can!! Thinking of you and praying for you and your family right now!